Ahead of its scheduled early 2019 release where it will hit cinemas, DVD and online platforms we can reveal the official trailer and two exclusive scene excerpts for Sorcha Groundsell's (star of Netflix hit The Innocents) fairytale-horror movie, FAR FROM THE APPLE TREE. “A tour de force of visual indulgence” - Toxic Fletch. 'Folk-Horror', 'Fantasy' and 'Pop Art Fairytale' have been variously used to describe this unique independent feature starring the Netflix drama The Innocents' Sorcha Groundsell, after its teaser release last summer. Groundsell plays Judith, a wide-eyed and innocent artist who has been given the offer of a life time – the opportunity to live and learn from renowned occult artist, Roberta Roslin (Victoria Liddelle, The Outlaw King). In exchange for cataloguing and archiving Roberta's visual archive Judith will be trained, moulded and prepared for her first solo art exhibition. To her horror, Judith soon realises that there is more to Roberta's offer than she initially thought as she discovers a mysterious woman hidden within the archive – Roberta's missing daughter who bears a striking resemblance to herself. Judith is faced with a battle between artistic integrity and her own mind. Directed by Grant McPhee (Post Punk documentary Big Gold Dream, one of 2015's Sight and Sound picks of the year, and psychedelic horror Night Kaleidoscope) and with a soundtrack by underground artist Rose McDowall (Psychic TV, Strawberry Switchblade, Current93) FAR FROM THE APPLE TREE follows in the tradition of The Wicker Man, Alice in Wonderland, Valerie's Week of Wonders, Jean Rollin and Rebecca with an added large dose of dark psychedelia. The film utilised decades old vintage camera equipment to help weave its dreamlike state and reality-shifting storylines. Formats included 35mm, Betamax, Super8 and Home Developed film. 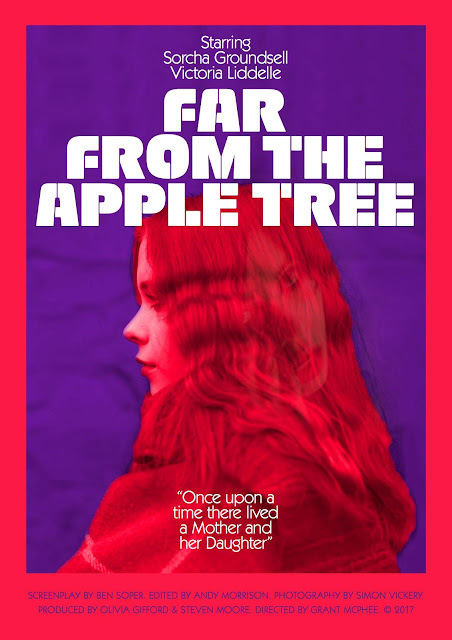 FAR FROM THE APPLE TREE will hit cinemas, DVD and online platforms in early 2019.